Air Supply Silencer Pool Spa Hot Tub Blower 1.5 HP 120V 6316120. Silencer Outdoor Air Blower rated at 1.5 HP 120v 8A part# 6316120 by Air Supply of the Future. The New Silencer By Air Supply has taken a quantum leap in quiet performance. The unique motor mount is the secret to our success. A thick rubber cup encases the fan while allowing the motor to vibrate freely on a flexible rubber base. This combination eliminates noise so well that virtually no foam is required. Many competitive blowers uses filter foam to reduce noise, but foam may clog over time causing starvation and overheating. Included with each silencer is a durable spring check valve. This is far more effective than flapper valves at stopping motor damage, which means fewer service called and more satisfied customers. Air Supply is committed to quality and service. With over 30 years experience in the Florida pool industry, we are experts when it comes to pool parts advice and customer service. Thank you for choosing Positive Pool Wholesale Supply. 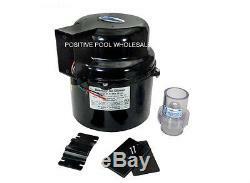 The item "Air Supply Silencer Pool Spa Hot Tub Blower 1.5 HP 120V 6316120" is in sale since Wednesday, December 18, 2013. This item is in the category "Home & Garden\Yard, Garden & Outdoor Living\Pools & Spas\Spas & Hot Tubs". The seller is "positivepoolwholesale" and is located in Florida & Arizona,Georgia. This item can be shipped to United States.